We already know that in summers we need to wear those shoes which are breathable, versatile, and can also be worn in winters. Well the good news is you don't need to buy new pairs for yourself! Summer shoes can be worn with almost every outfit. 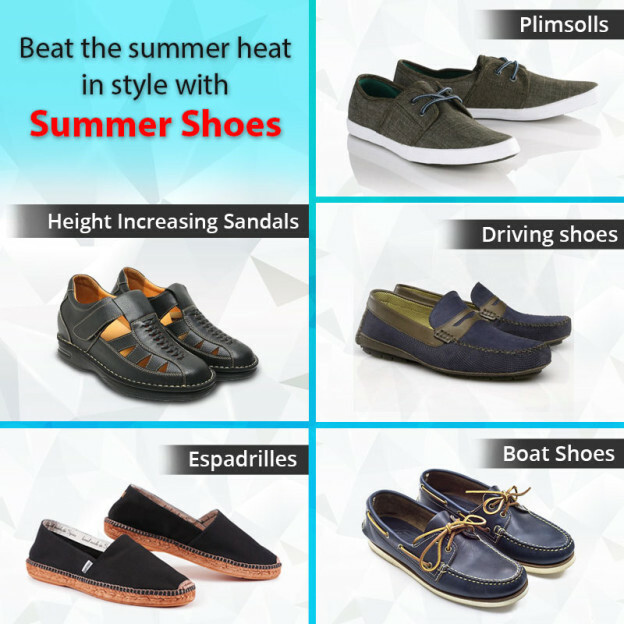 There are numerous varieties of summers shoes like boat shoes, drivig shoes, sandals, brogues, espadrilles and trainers. So, here are few shoes that are a summer staple! Driving Shoes: A big YES to this shoe especially for the warmer months. They are very comfortable and lightweight – what else can you wish for? As mentioned, driving shoes are highly practical and can be styled with shorts, chinos, and jeans. For the hot days, you can freely ditch your socks and wear these shoes. The best part is, these shoes can be worn to both casual and formal events. Moreover, summer weddings are the perfect way to show off your driving shoes. Go for brown, tan or black colors – they give a symbol of class. Other colors like yellow, red and blue ae good for hanging out with your friends. Boat Shoes: This is one of the most versatile piece of style and every man should own this. These were designed in 1935 by Paul A.Sperry to prevent the sailors from slipping in boats. These shoes have rubber soles which gives you a preppy look. Boat shoes comes in many colors and are perfect for your first date. Like driving shoes, they can be worn without socks. Team your boat shoes with a white crisp Oxford shirt with navy color chinos. If it's a bit chilly, then wear a jumper or blazer. Second option is – wear these shoes with khaki or tailored shorts or jeans with a white T-shirt. Espadrilles: You can judge from the name only – these are Spanish. These shoes are made from cotton fabric or canvas witha jute sole, making them different from others. They can be slightly heeled or flat and are famous for their patterned look. Team espadrilles with shorts or a pair of jeans. Plimsolls: These shoes can be a great option if you don't fancy for wearing espadrilles or trainers. However, wearing these shoes can take you back in your school times and can give you a good vibe. These shoes are great for your holidays, especially if you are planning for a city adventure walking. Denim shorts would be great no matter what style or color you choose. Sandals: The most wanted and choosen by every man. They are perfect if you are planning for a pool side party, grocery shopping or a beach walk. Any pattern or color would do. For your outfit look – wear them with your trunks and a tank top. Good news is even if you are short in height; you can wear height increasing sandals designed with concealed heels giving you a subtle raise of 2to 3 inches without compromising on style. On That Note: Now you have an endless choice for summers, so take your best pick and create summer statement. Happy Summers!